The station that handled it all . The Point-au-Père station was distinguished by the numerous functions it fulfilled. A host of services emerged to support the lighthouse and pilot station. The station served as an incubator in many ways. The Marconi station . In 1859 telegraph connections between Point-au-Père and Québec were established, the sole method of quickly transmitting information to its port and that of Montreal. Everything changed in 1906 with the installation of a Marconi station, capable of transmitting wireless signals up to 483 km. Ship-to-shore communication improved dramatically. Fourteen other wireless stations handled transmission up and down the St. Lawrence and Atlantic coast. Medical inspection services . In 1923, the Point-au-Père station took on some of the responsibilities of the Gross-Île quarantine station. Using pilot boats, doctors boarded vessels sailing upriver and conducted inspections. They remained on board, going to Gross-Île if there were passengers requiring quarantine, or to Québec if all was well. This service ceased in 1936 with the closing of the quarantine station. The tide and current survey station . The Point-au-Père marigraph, which recorded tidal movements continuously from 1894 to 1983, made possible the compilation of a regional tide table. The station also helped establish Canadian and international altimetric references. Much of the station's uniqueness and importance, heralded in the scientific community, are due to its long existence. [Photo captions, from left to right, read] . . The Marconi station was situated on property to the west of the station.
. tide and current survey station [circled] . The graduated gauges used by the tide and current survey station were located in this shed at the end of the wharf. La particularité de la station de Point-au-Père était sa polyvalence. Autour de phare et du poste de pilotage, se greffaient divers services et fonctions. La station a même servi de laboratoire dans quelques domaines. Dès 1859, Point-au-Père est relié à Québec par télégraphe, unique moyen de transmettre rapidement des renseignements vers ce port et celui de Montréal. Une révolution se produit en 1906 avec l'arrivée de la station Marconi, capable d'émettre sans fil jusqu'à 483 kilomètres. Les communications avec les navires s'en trouvent grandement améliorées. Quatorze autres stations TSF assurent la transmission le long du Saint-Laurent et de la côte atlantique. avec la fermeture de la station de quarantaine. De 1894 à 1983, le marégraphe de Point-au-Père a enregistré sans relâche les mouvements des marées. Ces données ont permis de dresser la table régionale des marées. La station a aussi contribué à l'établissement de références altimétriques canadiennes et internationales. Son unicité et son importance, reconnues par le monde scientifique, reposent sur sa longévité. • La station Marconi était située sur un terrain à l'ouest de la station. Ce bâtiment au bout du quai abrite les jauges graduées de la station de relevé des marées. • Plusieurs ministères utilisaient les bateaux-pilotes de Point-au-Père. Ici, des agents d'immigration montent à bord de l'un d'entre eux. The Point-au-Père station was distinguished by the numerous functions it fulfilled. A host of services emerged to support the lighthouse and pilot station. The station served as an incubator in many ways. In 1859 telegraph connections between Point-au-Père and Québec were established, the sole method of quickly transmitting information to its port and that of Montreal. Everything changed in 1906 with the installation of a Marconi station, capable of transmitting wireless signals up to 483 km. Ship-to-shore communication improved dramatically. Fourteen other wireless stations handled transmission up and down the St. Lawrence and Atlantic coast. In 1923, the Point-au-Père station took on some of the responsibilities of the Gross-Île quarantine station. Using pilot boats, doctors boarded vessels sailing upriver and conducted inspections. They remained on board, going to Gross-Île if there were passengers requiring quarantine, or to Québec if all was well. This service ceased in 1936 with the closing of the quarantine station. The Point-au-Père marigraph, which recorded tidal movements continuously from 1894 to 1983, made possible the compilation of a regional tide table. The station also helped establish Canadian and international altimetric references. Much of the station's uniqueness and importance, heralded in the scientific community, are due to its long existence. • The Marconi station was situated on property to the west of the station. The graduated gauges used by the tide and current survey station were located in this shed at the end of the wharf. • Point-au-Père pilot boats served various ministries. Immigration agents are shown boarding one of the vessels. Location. 48° 31.047′ N, 68° 28.148′ W. Marker is in Rimouski, Quebec, in Rimouski-Neigette MRC. Marker is on rue du Phare, on the left when traveling east. Touch for map. 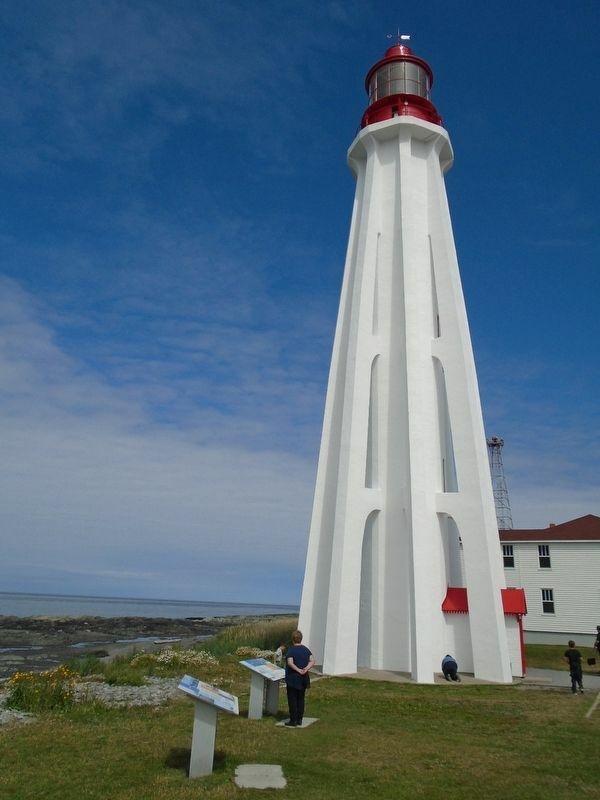 Marker is adjacent to the Pointe-au-Père Lighthouse. Marker is at or near this postal address: 1000 rue du Phare, Rimouski, Quebec G5M 1L8, Canada. Touch for directions. Other nearby markers. At least 8 other markers are within walking distance of this marker. Les pilotes / The pilots (here, next to this marker); Les gardiens de phare / The lightkeepers (a few steps from this marker); Les pilotes du Saint-Laurent / St. Lawrence Pilots (a few steps from this marker); Le phare de Pointe-au-Père / Point-au-Père Lighthouse (a few steps from this marker); Père Nouvel (within shouting distance of this marker); Les Fusiliers du St-Laurent (within shouting distance of this marker); La station de pilotage / The pilotage station (within shouting distance of this marker); Innovation (within shouting distance of this marker). Touch for a list and map of all markers in Rimouski. More. Search the internet for Polyvalence / Versatility. Credits. This page was last revised on December 7, 2018. This page originally submitted on December 6, 2018, by William Fischer, Jr. of Scranton, Pennsylvania. This page has been viewed 34 times since then and 5 times this year. Photos: 1, 2. submitted on December 7, 2018, by William Fischer, Jr. of Scranton, Pennsylvania.